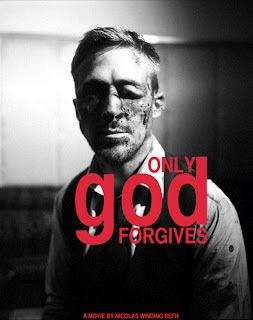 Everything about Only God Forgives is slow. Each action and movement is carefully placed, deliberate and purposeful; the editing and pace of each shot is measured, lulling you into its rhythm; the soundtrack (or frequent lack thereof) is sometimes a noisy and abstract soundscape, sometimes electronic and pulsating, sometimes cerebral and calm. In the vacuum of silence, even echoing footsteps are given ominous significance. It lends the film a hypnotic quality, as if the events are unfolding within a dream – or, indeed, a nightmare. This is only heightened by the neo-noir visuals: bright neon lights and inky darkness, all drenched in reds and blacks. It’s for this reason that the film is so deeply unsettling. Yes, it is violent, including a gruesome eye-cutting scene reminiscent of Un Chien Andalou, but the violence takes on increased psychological pertinence with the audience in such a mesmerised state of mind – a lucid dream from which you cannot wake. The tiniest details pop from the screen – none more so than the performance of Vithaya Pansringarm as Chang, in one of the most frightening instances of villainy in recent years, with a pair of eyes that look through the camera, through the screen and straight through the audience as if to say “you’re next”. With director Nicolas Winding Refn’s flare for audio and visuals, it’s fair to say that Only God Forgives is an incredibly sensory experience, as referenced by the tactile performances that emphasise touch, juxtaposed with the frequent chopping off of hands with a shortened samurai sword that leaves Chang’s victims helpless. It’s also disturbing for its subject matter that deals with an incestuous Oedipal love triangle between a mother (in a remarkable white trash performance from Kristin Scott Thomas) and her two sons – one alive (Ryan Gosling) and one dead – all set to the backdrop of a seedy Bangkok underworld. As with Drive and The Place Beyond The Pines, Gosling plays the strong and silent type who, here, can only be put in his place by his mother, the one woman he aims to please and protect. Typically for Gosling, he manages to say a lot with extremely minimal dialogue. Similarly, the film leaves much unsaid, the audience left to pick up the pieces of these one-dimensional characters, hell-bent on revenge. The audience is left cold, wondering what it all means thematically. Yet narrative is clearly not the focus of Only God Forgives and, in this respect, it is a cinematic experience not to be missed. This is a polarising film that makes for uncomfortable viewing: daring, provocative and incredibly well executed.